Some people will have difficulty getting used to the long passages with opera-voices and choir and the mostly sacred atmosphere won’t be to everyone’s liking either. 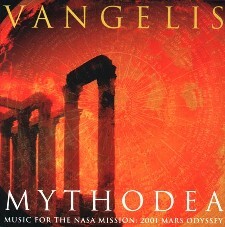 With “Mythodea” Vangelis clearly moves into a more classically oriented direction and, after having done so much already and maybe not having much if anything left to prove anymore, tries his hand at a piece of music of larger proportions and different instrumentation. Elements like the symphonic, vocal and philosophical could always be found in his work, but invariably in the context of his own self-produced and relatively short pieces of music. Never before did Vangelis leave the performance of one of his pieces so much to others as he does with this work – the parts he played during the 2001 concert and on the recorded album are quite minimal and pretty basic. Among the large group of Vangelis fans who are not also classical music fans, this album seems certain to cause division. Most of them will probably have bought the album after so many years of inactivity by Vangelis in terms of releasing music and a decent number of those will undoubtedly be able to find something in it that appeals to them.